It was the beginning of something magical for the Mets, and the beginning of the great Expos of the late 70s and early 80s starting to break up. Gary Carter came to the Mets in a trade that sent Hubie Brooks, catcher Mike Fitzgerald, and prospects Herm Winningham and Floyd Youmans to Montreal. In the New York Times article about the trade, the Mets GM Frank Cashen called it a "Banner day for the Mets." Turns out, he was right! 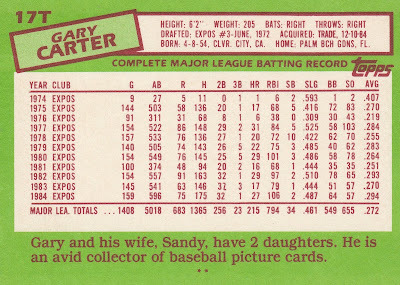 Carter provided right handed power to complement the phenom Darryl Strawberry's lefty pop, as well as veteran leadership at a core position. 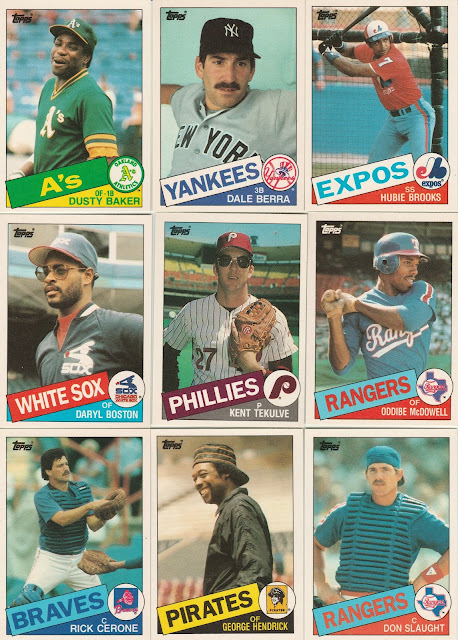 The Traded backs take the gross puke green color of the base set and turn it up a notch. The key rookies in the set include the base stealing virtuoso Vince Coleman, Short Stop turned feisty manager Ozzie Guillen, 2 time world series Champ Mariano Duncan ('90 Reds and '96 Yankees), and the slugging backstop Mickey Tettleton. Coleman was probably the most hyped at the time, followed closely by Duncan. 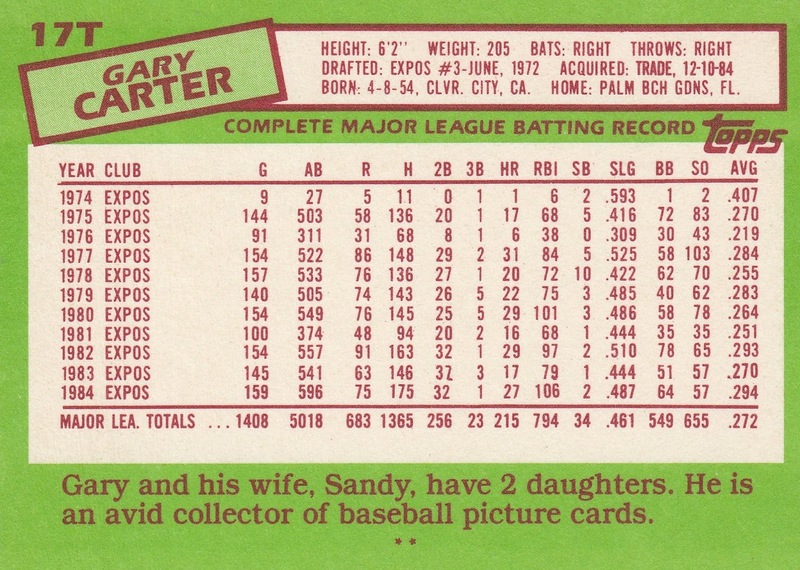 In addition to Gary Carter, there were four other Hall of Famers in the set. Rickey Henderson left Oakland for the first time, spending a few years in pinstripes. Don Sutton continued his march to 300 career victories with Rickey's former and future team. Bruce Sutter went down to Georgia to finish his career, and Earl Weaver has a card as Orioles Manager - he was the 3rd manager for Baltimore that season, (Joe Altobelli started the season, Cal Ripken, Sr. won the one game he managed, then Weaver was hired.) and he'd stick around for one more season. 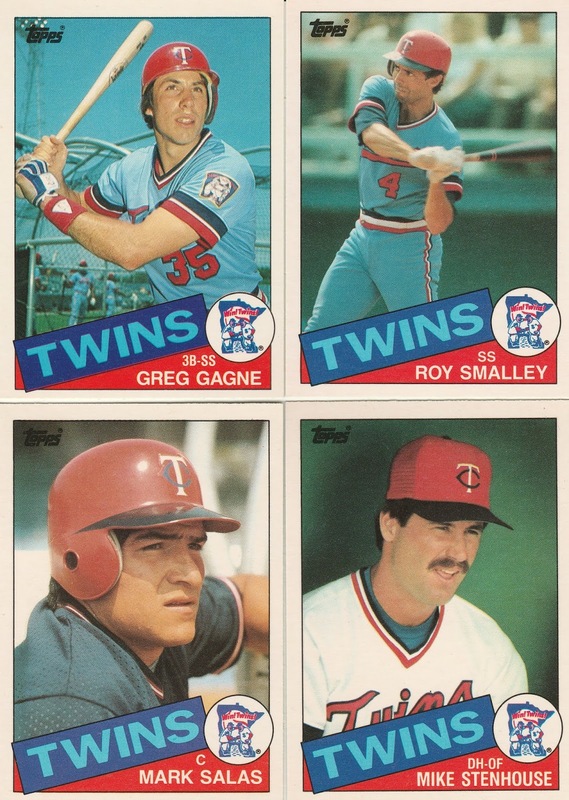 Four Twins in the set - Greg Gagne's card is his first Topps card, his rookie was in the 1984 Donruss set. He would be the Twins' starting Short Stop for both World Series championships. Roy Smalley returned to the Twins after an earlier trade to the Yankees. 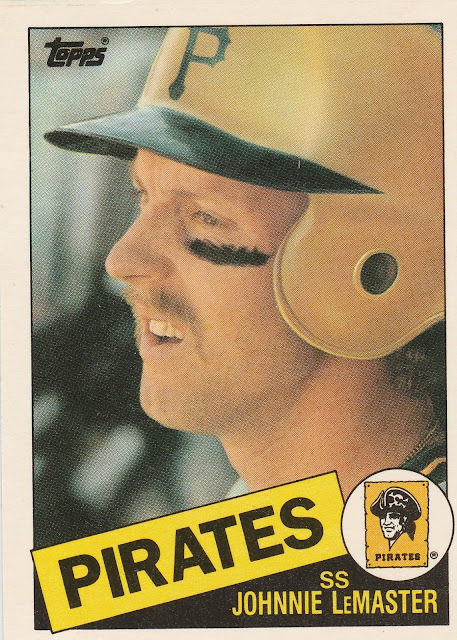 Mark Salas would stick around until part way into the 1987 season, traded to the Yankees for Joe Niekro. Mike Stenhouse played as a part time DH and reserve outfielder for the Twins in 1985- he would move on to Boston the following season. 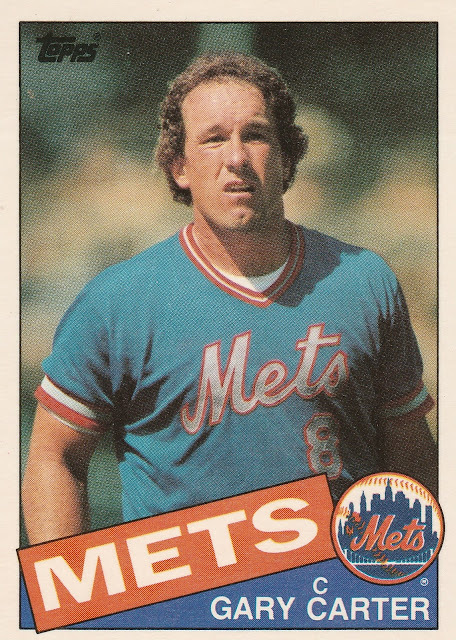 The set had several more 70s/80s stars changing uniforms - Gary Carter was the big name coming to New York, but they also added the under the radar corner infielder Howard Johnson. 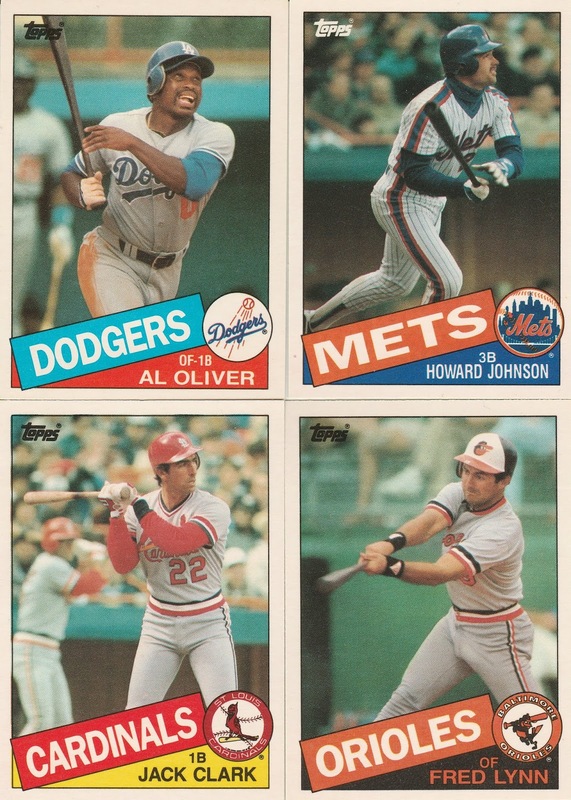 Jack Clark was on the move to St. Louis, and Fred Lynn was trying out the AL East again as a member of the Orioles. 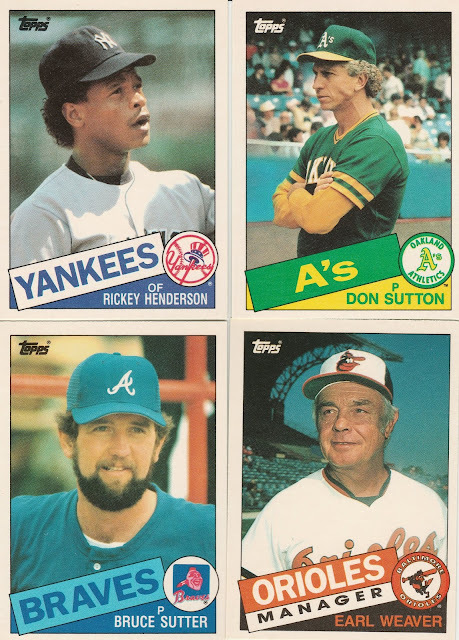 I think more so than in recent traded sets, there were a ton of great photos, and I had a hard time picking just a few to sample. Oddibe McDowell was the Rangers #1 Draft pick in '84, he didn't have any stats on the back of his card yet. One of the few airbrushed logos was this Johnnie LeMaster - DiSaster! 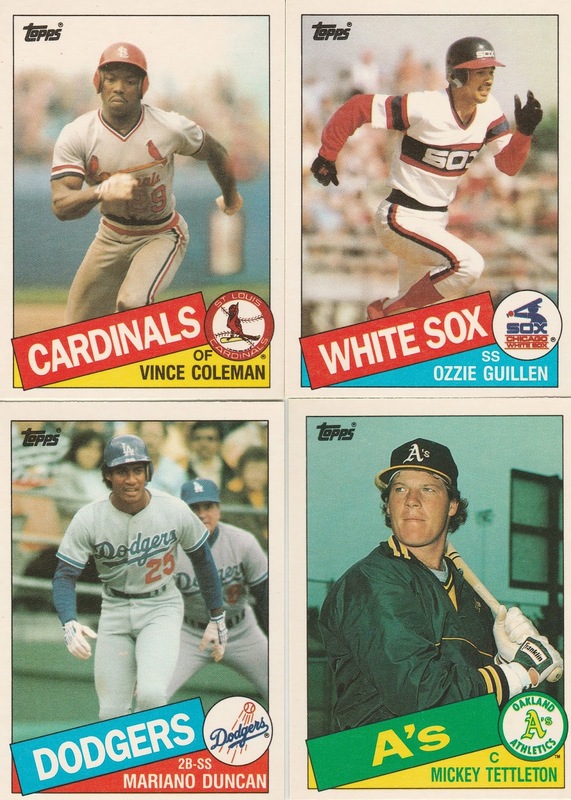 Man... there was a time when I would have given you almost any card in my collection for that Vince Coleman. As for LeMaster... I had no idea he played for the Pirates. Definitely remember watching him play at Candlestick though when I was a kid.